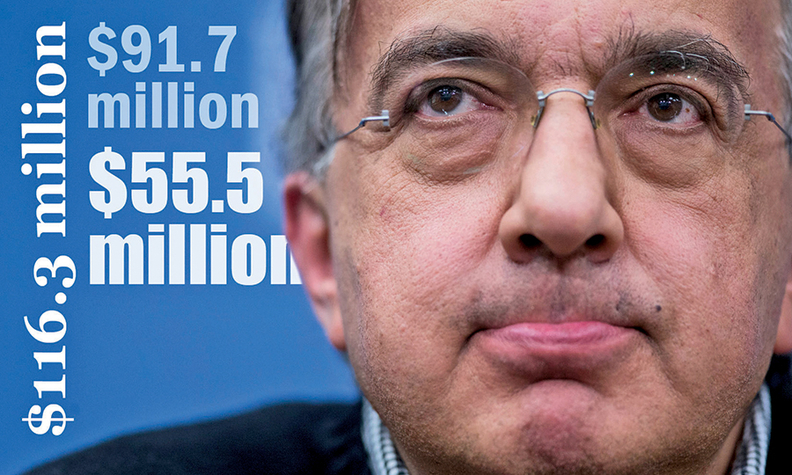 How much did Sergio Marchionne earn last year? News reports we saw ranged from $8 million to $72 million for the Fiat Chrysler Automobiles CEO. So what was the actual golden sum? $1,718,200 in cash and $290,400 in benefits for being FCA's chairman. $3,025,000 in salary, $121,000 in benefits and $4,840,000 in bonus for being its CEO. A $29,887,000 cash award for, among other things, completing the merger of Fiat S.p.A. and Chrysler Group in 2014. $15,609,000 in potential pension/severance payments when he leaves the company. Add it up, and you get $55.5 million. But that's just for starters. 2,333,333 shares of FCA stock. Though received in 2014, the shares vested on Feb. 22, when the stock was valued at $15.50 per share, for a total of $36,166,662. That pushes the tally up to $91.7 million. A one-time grant of 1.62 million restricted shares of FCA. The grant must be approved by shareholders in April, but at the company's recent closing share price of $15.22, the shares would have a value of $24,656,400. All together, that's about $116.3 million. And that doesn't count the options Marchionne received for millions of shares of FCA and Case New Holland International that he earned for his previous work spinning off the farm equipment manufacturer. So, yes, Marchionne's 2014 earnings can be reported in various ways. But whether his payday was $55.5 million, $91.7 million or $116.3 million, it will buy a lot of black pullover sweaters.